0The Systems Modeling Language (SysML) extends UML with powerful systems engineering capabilities for modeling a wider spectrum of systems and capturing all aspects of a system's design. 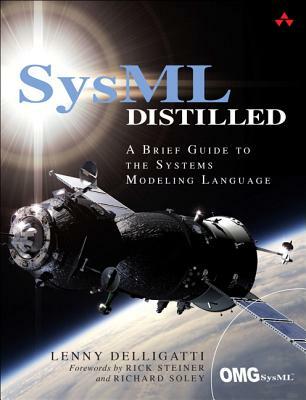 SysML Distilled is the first clear, concise guide for everyone who wants to start creating effective SysML models. (Drawing on his pioneering experience at Lockheed Martin and NASA, Lenny Delligatti illuminates SysML's core components and provides practical advice to help you create good models and good designs. Delligatti begins with an easy-to-understand overview of Model-Based Systems Engineering (MBSE) and an explanation of how SysML enables effective system specification, analysis, design, optimization, verification, and validation. Next, he shows how to use all nine types of SysML diagrams, even if you have no previous experience with modeling languages. A case study running through the text demonstrates the use of SysML in modeling a complex, real-world sociotechnical system. Modeled after Martin Fowler's classic UML Distilled, Delligatti's indispensable guide quickly teaches you what you need to know to get started and helps you deepen your knowledge incrementally as the need arises. Like SysML itself, the book is method independent and is designed to support whatever processes, procedures, and tools you already use.